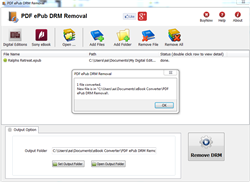 PDF ePub DRM Removal is tools to remove ADEPT DRM protectio from PDF/ePub ebooks, it create a new ebook file without DRM limitation, support text select/copy function and keep origin ebook file without change. user can view PDF ePub ebook on iPad, NOOK, Sony Reader, Kobo or other device without DRM limitation, user also can print Digital Edition ebook. read it in Kindle after convert new ebook to .mobi format. 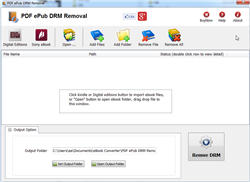 1 Download and install PDF ePub DRM removal. authorize computer in digital editions . 4 Run PDF ePub drm removal, select ebook file to decrypt, click “Digital editions” button to import ebook files.